If you have a lot of files saved on your computer and the number keeps on increasing every day because of the work you do, then you should consider backing up your files on at least weekly basis. This can help you avoid any data loss in case of system breakdown. If you do not know how you can back up a hard drive on a computer using Windows XP, then you do not need to worry as this article will help you in learning the whole process in just a few minutes. First of all, you have to insert the Windows XP CD in your computer’s CD drive and double click when its window when it appears on your computer’s screen. Now you need to open the ValueAdd folder in your Windows Explorer and then the Msft folder, where you will find Ntbackup.msi file, which you will use to install the Microsoft's Backup utility. Double click the setup file and follow the onscreen instructions to complete the installation process for the Backup utility. Once the installation is complete, you need to click “Backup” to launch Microsoft's Backup program. Now go to the “Start” menu and point your mouse over “All Programs”. This will open a new list on your screen, where you need to point to “Accessories” and then to “System Tools”. Here, you will find the “Backup” option. Click on it to start the backup wizard. 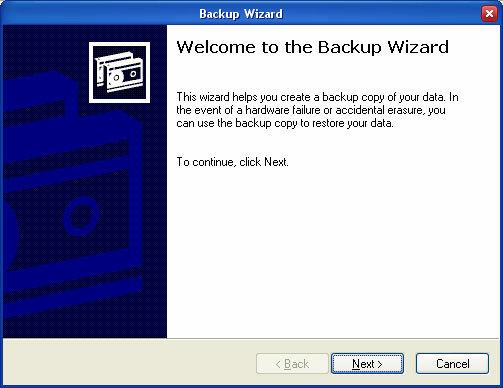 Click the “Next” button in the wizard and choose the Back up files option in the second page that appears in the window. Click “Next” to proceed to the next page. Now you will be asked whether to back up all the data present on the hard disk or you just want to back up specific files. If you want to back up specific files or folders, then choose them using the particular option and click “Next”. Now you will be asked to provide location where you want to save the back up files. Here, you can use a flash drive. Just connect the flash drive with your computer and provide its path to the Wizard and click “Next”. This will start creating a back up of your files that you selected, or the entire hard disk, depending on the option you chose. Once the back up is complete, you can disconnect the flash drive from your computer and keep it in a safe place.